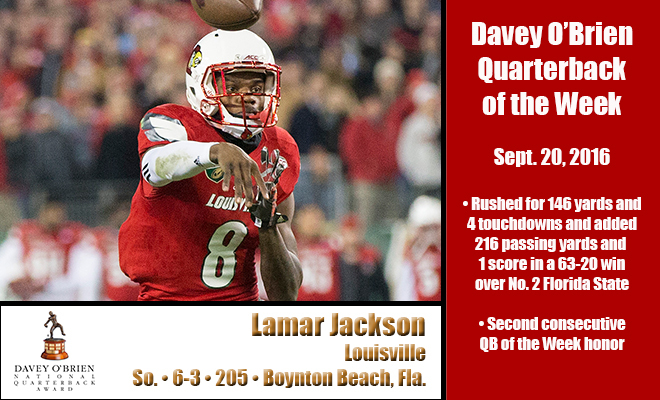 FORT WORTH, Texas (Sept. 20, 2016) – After another prolific performance, Louisville sophomore Lamar Jackson has been named the Davey O’Brien Quarterback of the Week for the second straight week, the Davey O’Brien Foundation has announced. On Saturday, the native of Boynton Beach, Fla., carried the Cardinals to a 63-20 rout of No. 2 Florida State. On the ground, Jackson totaled 146 yards on just 17 carries (8.6 yards per carry) and scored four rushing touchdowns. 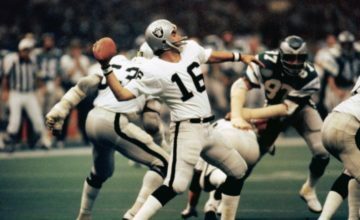 He also was 13-of-20 passing for 216 yards and one touchdown with one interception. He directs a Louisville offense that sits atop the nation in scoring at 65.0 points per game and has helped the 3-0 Cardinals match the highest AP ranking in school history (No. 3). Individually, Jackson has accounted for 18 touchdowns to rank tied for first nationally in points responsible for (108). Through three games, Jackson has thrown for 913 yards (50-of-82) and eight touchdowns, while rushing 49 times for 464 yards and 10 scores. He currently ranks among the nation’s top 15 in both rushing yards (2nd) and passing yards (15th). In addition, he is second in total offense (459.0 per game) and second in passing yards per completion (18.26). 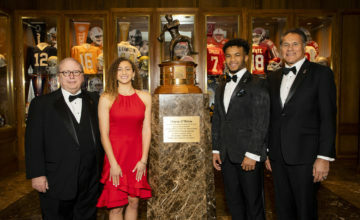 Jackson joins a pair of previous Davey O’Brien National Quarterback Award finalists, Trevone Boykin of TCU and Dak Prescott of Mississippi State, as players to win multiple weekly honors in the same season. Boykin accomplished the feat last season, while Prescott won the accolade twice in a three-week span during the 2014 campaign. Jackson is the lone player in the country to be named to the Davey O’Brien “Great 8” all three weeks this season. Just three other players have been named twice. All FBS quarterbacks are eligible for the weekly award, which is determined by a subset of the Davey O’Brien National Selection Committee. The other “Great 8” quarterbacks in week three were: J.T. Barrett (Ohio State), Jacob Eason (Georgia), Jalen Hurts (Alabama), Trevor Knight (Texas A&M), Patrick Mahomes (Texas Tech), Mason Rudolph (Oklahoma State) and Davis Webb (California). The Davey O’Brien Foundation is celebrating its 40th anniversary in 2016. 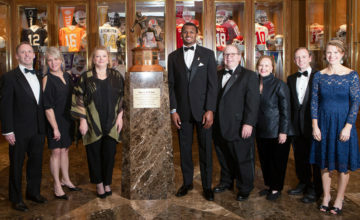 Since its founding in 1977, the Foundation has given away nearly $1 million in scholarships and university grants to help high school and college athletes transform leadership on the field into leadership in life.